life of a lost muse: Have You Tried THE TASTE? Have you heard of The Taste yet? It's this amazing new cooking competition that airs Tuesday nights on ABC at 8/7c. There are four judges: Nigella Lawson, Brian Malarkey, Anthony Bourdain & Ludo Lefebvre. Basically, these four are complete opposites in terms of personality, which means that there's A LOT of drama on this show. Each judge brings something cool to the table. Brian Malarkey is the judge who isn't afraid to speak his mind (plus he's a really snappy dresser -- I totally dig those bow ties!) while Anthony Bourdain is known to the world as the guy from No Reservations who isn't afraid to hurt someone's feelings. I have to say I really enjoy his brand of snarky sarcasm! Our lady Nigella is just crazy gorgeous and comes up with the best sound bites while Ludo is a bit hard to understand, but his accent makes him completely adorable. Let's break it down for you: You've got four teams, each sponsored by a judge. Within each team, the members compete with one another to create a single dish which is served to the judges on tiny spoons. But first, the members on each team must compete with each other, and are first judged within their own teams on who’s creation is the best, and that is the one that will be presented to the judges. The judges have a blind taste test, meaning that they have no idea what they're eating or what team made the dish on the spoon. I think this aspect adds something to the overall show, as the judges can't pick favorites if they don't know whose food they're eating! It's a fun, action packed show that features great judges and amazing looking food. You can't go wrong! Another aspect to the show is it's social media presence. There's a Twitter hashtag - #TasteTuesday - that can be used to connect with others who are watching the show as well. You can share your thoughts & opinions with other viewers, and who knows? Maybe you'll make new Twitter friends! 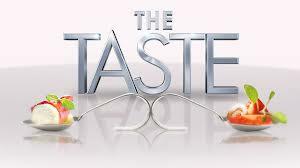 You can also follow the official account for The Taste (@TheTasteABC) and see the action in real time! Today is going to be especially cool. Judge Brian Malarkey (@brianmalarkey) is doing a live Twitter Party at 3/2c. You can send in your thoughts, opinions, questions....and Judge Malarkey will be there to answer them! I just love how interactive this show is! Seriously, though, I wouldn't miss it!